Writing at this age comes in varied forms. Scribbling and drawing are the beginning stages of writing. 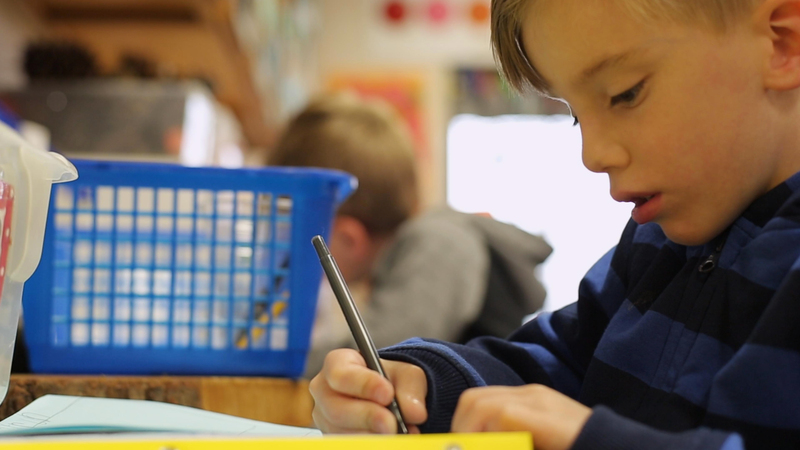 Eventually, children will begin making letter-like shapes and assigning meaning to their “writing.” Children need daily practice with writing, as well as practice strengthening the muscles in their hands and fingers. As a parent, you can promote writing skills at home by modeling and providing opportunities for writing in day-to-day routines. Have your child use plastic tweezers to pick up cotton balls and move them to a bowl. Squeezing the tweezers strengthens the same muscles used in holding a writing tool correctly. Have your child help you write a list of errands to run or activities for the day. Keep an ongoing grocery list that you help your child write. Provide your child with clay or Play-Doh®. Manipulating and shaping clay strengthen the muscles in a child’s hand and fingers. Provide your child with a journal or notebook to write about his day. He can use pencils, markers, or crayons to draw pictures and write a few words. Provide different topics for your child to journal about. The beginning stages of journal writing may be pictures and scribbles. Your child may hold the writing tool with his fist. Model how to hold the pencil correctly, with a tripod grasp. In a tripod grasp, the pencil is held between the thumb and the index finger, and it rests on the side of the middle finger. Have your child create paper nameplates for each family member’s bedroom. Tape the nameplate on each door. You may need to write out each name for her to copy. Bindman, S. W., Skibbe, L. E., Hindman, A. H., Aram, D., & Morrison, F. J. (2014). Parental writing support and preschoolers' early literacy, language, and fine motor skills. Early Childhood Research Quarterly, 29, 614–624.